Visual beauty of monstrous industrial ruins? I was in the Czech Republic the other week, on a fieldtrip with a group of geography students. We spent some time in Prague with its impressive architecture and many historical sites, but we also visited a large industrial city, Ostrava that is well off the international tourist trail. The Ostra va regional has a been a major centre for mining and heavy industry in central Europe and the city itself has grown up around huge iron works and steel plants. 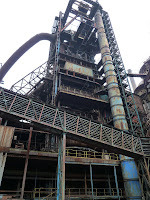 One of the highlights of the trip for me was a guided tour of disused Lower Vitkovice iron works. This is a vast complex of mine workings, a coking plant, gas tanks and massive blast furnace assemblages. The site is slowly decaying since its closure and the beginning of industrial ruins have a particular kind of aesthetic that I find appealing. The sheer complexity of the machinery and mysterious nature of it original purpose, the abstract geometry and inhuman scale of the structures, and the gorgeously varied colours of the rusting metal. The image above left is one of the pictures I took and there is some more details on the site are here. While the Manchester region has a great deal of industrial heritage, it has no vast ruins from large-scale heavy manufacturing on the scale of Ostrava. Apparently there was a large steel plant just outside Manchester proper, at Irlam on the side of the ship canal. Some historic aerial photographs of this site in its working days in the 1930s capture something of its scale. There is nothing remaining of the plant as the site is now an industrial estate and tracts of new housing. 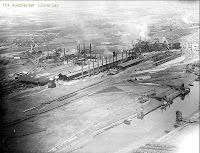 The Partington Steel Works in 1932. 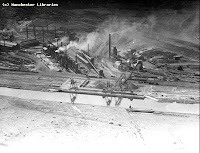 The Partington Steel Works in 1933.